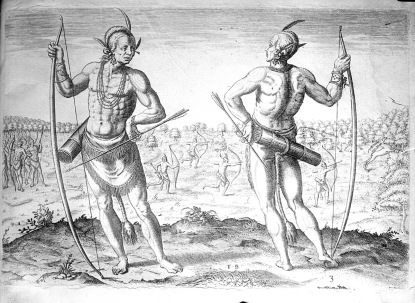 On August 13, 1587, Manteo, an Algonquian Indian, was baptized into the Church of England on Roanoke Island. The baptism was the first in the New World. A friend to colonists from earlier English attempts to settle on Roanoke Island, Manteo also traveled to England in 1584 and again in 1585. He returned to his home with the members of the 1587 colony, who would later become known as the Lost Colony. While in England, Manteo met Sir Walter Raleigh and spent time with the scientist Thomas Harriot, with whom he was already acquainted. He worked with Harriot learning English and teaching Harriot the Algonquian language. Raleigh designated Manteo “Lord of Roanoke,” and it is possible that his baptism was a requirement of receiving that title. Manteo proved to be a stalwart friend of the English, helping them navigate the multicultural frontier of the New World. His name lives on today as the name of the county seat of Dare County.